Evolutionary maternal effects occur whenever a mother’s phenotypic traits directly affect her offspring’s phenotype, independent of the offspring’s genotype. Some of the phenotypic traits that result in maternal effects have a genetic basis, whereas others are environmentally determined. For example, the size of a litter produced by a mammalian mother—a trait with a strong genetic basis—can affect the growth rate of her offspring, while a mother’s dominance rank—an environmentally determined trait—can affect the dominance rank of her offspring. 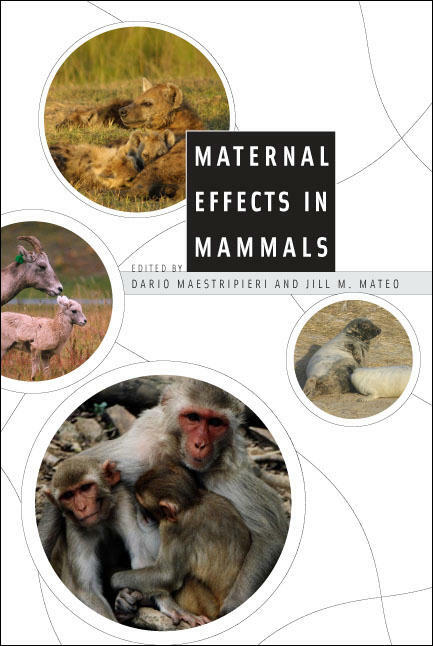 The first volume published on the subject in more than a decade, Maternal Effects in Mammals reflects advances in genomic, ecological, and behavioral research, as well new understandings of the evolutionary interplay between mothers and their offspring. Dario Maestripieri and Jill M. Mateo bring together a learned group of contributors to synthesize the vast literature on a range of species, highlight evolutionary processes that were previously overlooked, and propose new avenues of research. Maternal Effects in Mammals will serve as the most comprehensive compendium on and stimulus for interdisciplinary treatments of mammalian maternal effects.